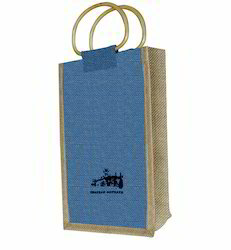 We offer Juteberry Jute Bottle Bags to our clients. Size/Dimension: 5.5"w x 13"h x 5"
Appx Size : 5.5"w x 13"h x 5". Our company brings forth excellent quality range of Wine Bottle Bags that is offered with foam padding bottom to give strong support to the bottle base. Canvas Two Bottle Holder Wine Bag with Real Leather Handles. Customization accepted. Owing to the efforts of our skilled professionals, we have been constantly engaged in offering a qualitative assortment of Portable Wine Bag. 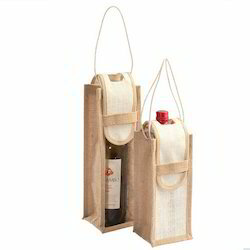 The expert team of our company proposes a huge assortment of six bottle wine bag to our respected clients. These are designed accordingly to hold the weight of 6 bottles. Crafted with sturdy handles, these are offered in mat designs with natural and blue color. Furthermore, we also provide customized solutions as per the client’s specifications.